Seventy years ago, Lyman T. Johnson became the first African-American student to enroll at the University of Kentucky. He, along with countless others, opened a door and created a path for us to follow. This month, our community is chronicling the stories of individuals who have opened heavy doors on our campus, and who continue to strengthen our community as we make progress together. You can see these stories here. One important way we build this sense of community, and foster this sense of place, is through intentionally designed facilities on our campus. Consider the spaces in the Gatton Student Center. The Martin Luther King Center, for example, is a space solely focused on promoting community and understanding on our campus. Our campus welcomed Jason Brooks, Director of the MLK Center, to the UK family last fall. Since moving into the new, state-of-the-art facility, he has, in partnership with students and staff, created a variety of new initiatives and priorities focused on enhancing belonging. This semester, already nearly 70 programs are scheduled within or in conjunction with the MLK Center. 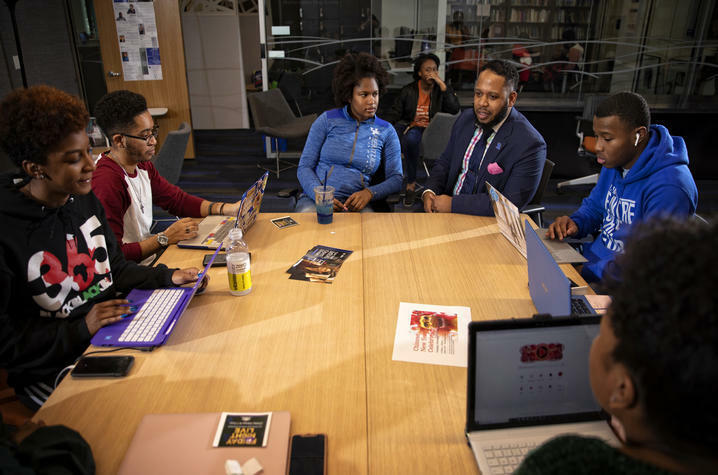 The MLK Center is also used by student organizations as meeting space, as well as an informal gathering spot for other groups and individuals. Earlier this academic year, we also dedicated the Dinkle-Mas Suite, a newly created multi-purpose community room and primary meeting space for student groups in the Office of LGBTQ* Resources. It was made possible thanks to the generous gift from Jim Dinkle, a College of Communication and Information alumnus who served as SGA president during his time at UK. Through the Dinkle-Mas Suite, individuals can access direct or referral services related to on-campus housing, holistic health and inclusive institutional identifiers. Additionally, multiple formal and informal student groups and classes utilize the space as a regular meeting site or comfortable space to study, network and develop a deeper sense of belonging as parts of a diverse university. These spaces underscore the powerful impact that facilities can play in our commitment to putting students at the center of everything we do. Our campus transformation, which is focused on student success, is not just about new buildings; it’s about intentionally designing space that facilitates a sense of community and belonging. That’s our promise: to provide an environment in which all people, regardless of perspective, identity, background or belief, can be the best, most authentic versions of themselves. And, of course, we always have more work to do. Our campus facilities strengthen our ability to achieve our strategic goals. So does every member of the UK family, as we all play a role in student success. Your efforts are important to our community’s journey of building belonging.